Contineo provides EMR implementation and optimization services to a multitude of academic medical centers, public health systems and other healthcare facilities. Below are some of our references. 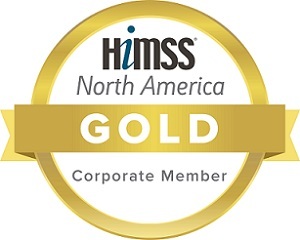 Contineo Health’s team of Epic analysts have provided excellent advisory, implementation and optimization services to our County System’s Epic Community Connect, Healthy Planet/Registries, Optimization (Ambulatory, Specialty), Lab Interface upgrade and various Enterprise Bl/Reporting projects over the last six years. 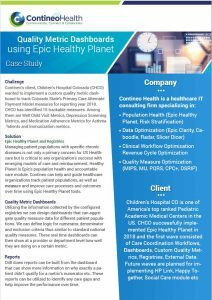 Contineo has helped us build our Disease and Wellness Registries and implement Epic Healthy Planet (Registries, BPA, Health Maintenance, CER rules, Case Management Workflows etc.). They have been involved in multiple Ambulatory upgrades and optimization projects. The team was pivotal in the Harris Health Community Connect project wherein several specialty clinics, including OB-GYN, Ophthalmology, Psychiatry, Pediatrics, Oncology, Family Practice, Infectious Disease and Refugee Health were brought in and optimized. Contineo’s team developed a range of functionalities including Navigators, Smart sets, Procedure sets, Notewriter templates, Synopsis view, Smartforms and Doc flowsheets. Contineo’s Report Writers have been involved in our County Public Health related Registry Reporting and also with DSRIP/MU/PQRS related reporting (Epic Clarity/RWB/Radar). The DW/ETL analysts have worked with our Epic Caboodle implementation and related data strategy (third party integration, SAP BO Universes etc.). Contineo’s team maintained a thorough and professional approach towards stakeholders and clinical staff and demonstrated good documentation practices. We have realized efficiencies in a wide variety of metrics (days to close the loop for referrals, days between order and resulting in lab tracking, patient wait times etc). They have the experience coupled with clinical and technical expertise to get things done right on schedule, under budget, and with high quality. Beyond their Epic skill sets (build, optimization, training), our customers and IT teams are extremely pleased with the soft skills of Contineo consultants. I would highly recommend them to other organizations for all Epic and HIT related projects. They have provided us a number of high-quality Epic certified candidates at critical times with following skillsets and have based most of their consultants local to Denver, CO, thus reducing overall costs. Contineo’s team of certified Epic Clarity Report Writers provided support for various modules of Epic Clarity including Professional Billing, Hospital Billing, ADT, Prelude and Cadence. Revenue Cycle/Billing reports created include those on aging, roll-forwarding, charges, payments and adjustments, aged trial balances, denials and on various work queues related reports. ADT reports included admissions, readmissions, discharges, transfers and census related reports. Cadence/Prelude reports consisted of reports associated with appointments, scheduling and registration. The team also worked with various outside vendors, including Conifer Health Solutions and PMMC to assist with their integration and reporting needs. We are extremely pleased and satisfied with the quality of work that Contineo’s team has provided us. The work was delivered on time and the service delivery teams and account managers were very responsive and professional and recommend them very strongly for all Epic IT consulting projects. Please reach out to us for additional references and specific case studies.